In Nevada, if a landlord fails to reimburse your security deposit in time and ignores a security request letter, sending them a Security Deposit Demand letter is your next step. Landlords in Nevada are under clear statutory obligation to return the tenant’s security deposit in no later than 30 days after the lease ends. Tenants have a right to their full security deposit if they have paid all their rent and leave the premise without any substantial damages beyond normal wear and tear. Any willful violation by the landlord to default from paying the tenant their rightful security deposit comes with legal consequences. Although a tenant has the right to exercise the legal process by filing a case in court, it can be a lengthy and stressful process. Sending this professionally written Security Deposit Demand letter gives the landlord the last warning or else face the law in court, where they are liable to pay for more damages. This letter refers to the Nevada state laws regarding the landlord’s improper retention of the tenant’s security deposit and informs them of your next move to sue them to get back the owed amount. Communications and anything agreed between you and the landlord should always be documented in writing to avoid any conflict in future. Sending this letter through certified mail guarantees the landlord receives it and you get a return receipt. Ensure to also make a copy of this letter to have proof if any issues arise. 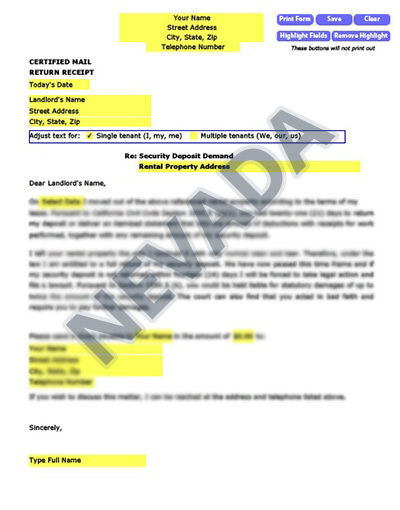 Our letters for Nevada renters are tailored to your state, with the right laws to get your landlord’s attention. We’ve taken care of the Security Demand details so there’s no hassle on your part to find the right law and craft an approrpriate letter. Our letters have been used in Nevada and all over America with great success.